Freshman Itsuki Ishihara dribbles past defenders like they aren’t even there. Pima won their first game at Nationals pretty handily, by absolutely obliterating the Jayhawks from Muskegon CC. A stiffer opponent is next on the cards for Wednesday as they take on the #8 seeded North Texas CC. If the Aztecs win that game they will secure a spot in the semi-finals. The Aztecs had their shooting boots on for this game as they scored three of the five goals in the first thirteen minutes. As well as outshooting the Jayhawks 23 to 5. Freshman Itsuki Ishihara scored three of the five, including the first two. Sophomore Hugo Kametani and freshman Johan Anderson had the other two goals. 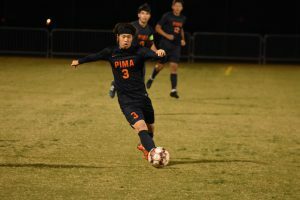 Freshman Ricky Gordillo, Edson Vazquez and Itsuki Ishihara each had assists. Freshman keeper Nils Roth made three saves in the game. The game was extremely heated and close from the opening whistle. Neither team established a rhythm, as they were both playing sloppy with turnovers and fouls. The game was notted up nill-nill and looking like it was going to Penalty Kicks, when Hugo Kametani stepped with a huge diving header to seal the victory. Since it was overtime, it was golden goal (which means, whoever scores first wins) the Aztecs sent the Badgers packing, ending their season. Pima will now head to Nationals in Dayton Beach, Florida as the number one team in the country. Nationals are from November 12-18. Thanks to Itsuki Ishihara’s first half brace the Aztecs advance to the District 1 championship game. All three goals were scored in the first half with Alec Nguyen opening the scoring in the 21st minute, which was folled by Ishihara’s brace. Ricky Gordillo assisted on two of the three goals, while Nils Roth had four saves on the night to help preserve his clean sheet.